Previous guidelines addressing surgery of adrenal tumors required actualization in adaption of developments in the area. The present guideline aims to provide practical and qualified recommendations on an evidence-based level reviewing the prevalent literature for the surgical therapy of adrenal tumors referring to patients of all age groups in operative medicine who require adrenal surgery. It primarily addresses general and visceral surgeons but offers information for all medical doctors related to conservative, ambulatory or inpatient care, rehabilitation, and general practice as well as pediatrics. It extends to interested patients to improve the knowledge and participation in the decision-making process regarding indications and methods of management of adrenal tumors. Furthermore, it provides effective medical options for the surgical treatment of adrenal lesions and balances positive and negative effects. 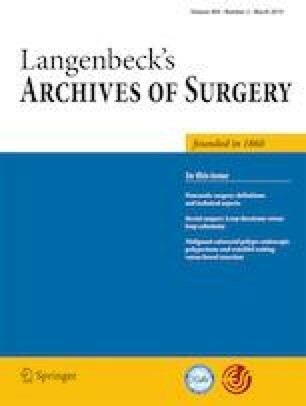 Specific clinical questions addressed refer to indication, diagnostic procedures, effective therapeutic alternatives to surgery, type and extent of surgery, and postoperative management and follow-up regime. A PubMed research using specific key words identified literature to be considered and was evaluated for evidence previous to a formal Delphi decision process that finalized consented recommendations in a multidisciplinary setting. Overall, 12 general and 52 specific recommendations regarding surgery for adrenal tumors were generated and complementary comments provided. Effective and balanced medical options for the surgical treatment of adrenal tumors are provided on evidence-base. Specific clinical questions regarding indication, diagnostic procedures, alternatives to and type as well as extent of surgery for adrenal tumors including postoperative management are addressed. Walz M: received speaker’s honorarium from: Karl Storz GmbH, Medtronic Co.